"This is a good sandwich or cracker spread, much like tuna fish or chicken salad. Yummy!" 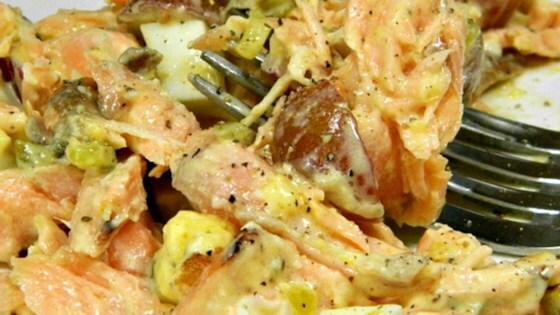 Mix salmon, mayonnaise, mustard, relish, raisins, red onion, celery seed, salt, and pepper together in a bowl. Chop eggs, add to salmon mixture, and mix. Refrigerate salmon salad until chilled completely, at least 30 minutes. Try red or green grapes in place of the raisins for a different flavor. Made this recipe with light miracle whip instead of mayo. Delicious!